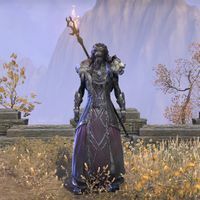 Vykosa the Ascendant was a Khajiit huntress who, according to a legend, became one of the first werewolves, afflicted with lycanthropy directly by Hircine. She had the ability to control most werewolves and assembled an enormous pack with plans to conquer all of Tamriel. Sometime before 2E 583, Vykosa took over Moon Hunter Keep, which was initially a fortress of the Silver Dawn, an organization dedicated to hunting down werewolves. From there, she plotted to take over Nirn, exact revenge on Hircine, and take down anyone that stood in her way. She was able to gather the largest werewolf pack Nirn has ever seen, consisting of both the willing and unwilling. Many werewolves came to Vykosa for safety in numbers and heard tales of her pact defeating the Silver Dawn. Vykosa had the power to bend the will of most werewolves and turned many of her victims into slaves in her ranks. She was able to further empower her followers by having her archivist research how to make werewolves stronger. Through various horrible experiments on people, she was able to create a new type of werewolf known as a werewolf behemoth. Werewolf behemoths would have amplified strength and size and would be unstoppable warriors in Vykosa's pack, should they survive the process. Vykosa's plot was foiled in 2E 583 by the Undaunted, who entered Moon Hunter Keep and killed her. They then severed her head and took it as a trophy. Vykosa's head, now a trophy. Vykosa depicted in a Bust.